What is the difference between embracing a leader and being a fanboy? The difference is participation. A fan sits back on the bleachers, judging a performance. He cheers and boos his beloved player, but he is ready, at the drop of a hat to abandon him. The fan’s loyalty is contingent on the performance, not deep love and respect. He can just as easily find another team or leader. Embracing a leader in the positive sense means putting oneself in the humble position of having to learn something. It is profoundly participatory. It is being willing to forgo judgment at times. It is also willing to accept the leaders failures, as well as his victories — to go down with the ship if necessary—if one believes in the general project of that leader. It is love above power, in other words. I’ve been thinking about this in terms of the ‘fanboy’ phenomena which surrounds Jordan Peterson. The word ‘fanboy’ is a grotesque slur, it implies that those who ‘follow’ Peterson are blinkered disciples of some conservative rock star. Those of us who take Peterson’s works seriously should be profoundly insulted when they hear this nasty little phrase sent out in our direction. But also, we should not be fans of him or anybody else. The word ‘fan’ should evoke nausea. Not to say that there is any great harm in being a fan of a music group, or a sports team, or anything of that nature—but one has to acknowledge the superficiality and limitation of this: of being a mere spectator. This is not a noble path towards real individuation. It not the way to gain a real soul, in other words. There is no homogenous ‘we’— belonging to a cult of Jordan Peterson. There may be an ‘all too human’ response of gleeful applause towards a person of accomplishment, towards a hero. However, fandom is a profoundly adolescent response. This is not what Dr. Peterson is promoting, which has more to do with ‘grow up and grow some teeth’. 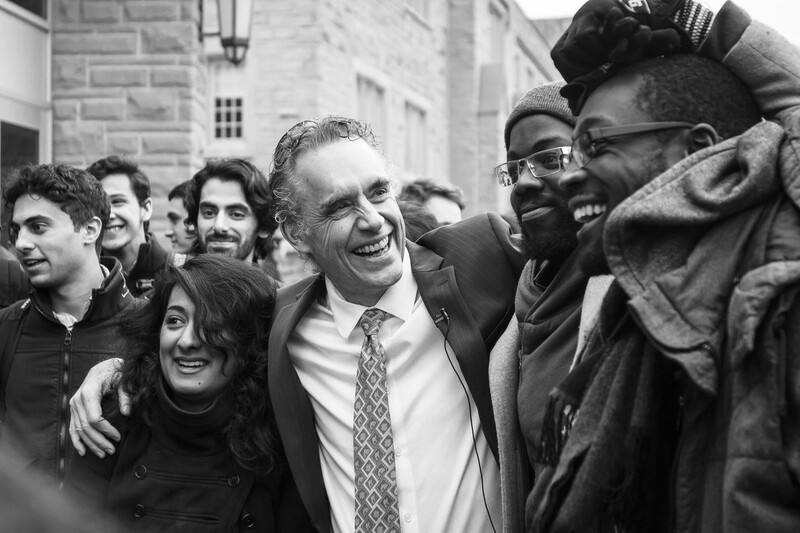 There is no responsibility in being a fan—and if Peterson has one essential message, it is that of responsibility. There is a dark side to the hero myth, which is well explored in greek and Shakespearean tragedy. The ‘good king’ becomes isolated in his court, is surrounded on all sides by yes-men with daggers in their back pockets. Peterson should know: be wary of fans and ministers—be suspicious of yes-men. They are dangerous; they will prop you up but they will not sustain you. Furthermore, the most ardent ‘fans’ may betray their leader eventually. This story of betrayal is built into the Christian archetypal story obviously, which Peterson promotes—and I dare say embodies—at times. He seems to be willing to talk to anybody, for example—the whores and the moneylenders, certain unscrupulous and blinkered reporters at the New York Times, his enemies and friends. And sometime he speaks to them without a great deal of discrimination. He seems to want to ‘save’ everybody—the whole world in fact. Certainly, he can’t do this alone, but let us not snigger at this goal which is traditional: a buddhist takes the The Bodhisattva Vow—to abandon liberation until all beings are free suffering: ‘To save all sentient beings’. Since I’ve been studying his work—intensely to the point of possession—I admit, within myself that there is the ‘anxiety of influence’—a phrase Howard Bloom coined—the bitter taste and secret envy of being a fan. I’ve been too much of a fan at times—it’s made me reactive on twitter and facebook especially. On social networks there is always the impulse to attack first and damn the consequences. Perhaps Peterson has also been a bit defensive at times (too much of a fan of his own project? )—understandably, however, considering the vileness of the attacks he has been subject to. We need to digest a thinker and then find our own voice, to go beyond that thinker, to not rely on them, or be parasitical. It takes time and gestation to absorb the work, so some imitation may be part of that. But we should be wary. And very afraid. There is something of the spectacle in Peterson’s performance and all the hubbub that surrounds it. This implies an almost compulsive desire, on the side of both his supporters and detractors, to judge the spectacle rather than the ideas. This is magnified in a polarised media landscape. There is no need to give examples—this has been written about ad naseum. It can be observed in the reaction of any person of charisma and spiritual power. In my last essay, I suggested that the spectacle of Peterson was wearing a bit thin, which I think is true. However, as a musician I know that grinding days on the road can drive down the spirit of anybody. Peterson, like everybody else, has his moments when he is ‘on fire with the holy spirit’ and when he is just going through the motions. In general, I think that Peterson is the captain of a pretty stainless ship — that his ideas and works are durable—which doesn’t mean the ship doesn’t have some design flaws here and there. These design flaws are built into everybody—into every ‘personality’, in other words. The point is: we need to distinguish between the personality and the soul—the spectacle and the essence. I hope that my questions and critiques of him are posed in a spirit of good faith, and fundamental support. If the ship is durable, then the media, and their legions, will not be able to sink it. However, if I become a parroting fan of his ideas, then please shoot me. (Metaphorically speaking, that is). Compressed scraps of angel melody, stories, essays, rants against reductionism, commands from the deep.